What Paige really wants is to be touring Europe with an opera company. She’s come close in the past, but it just isn’t happening right now. Really, she should be glad to have a job at all right now, even if it is just coaching a glee club in suburban Chicago. At least she’s coaching the best singers at Prospect Glen, even they don’t all necessarily have much faith that her operatic experience will translate int o a win for them. It isn’t long, though, before everything begins to fall apart. School hasn’t even started yet, Paige and the kids are still at choir camp when the much-loathed glee club coach at the rival high school is found dead and one of Paige’s students is suspected of murdering him. Although she has only very recently met the kid, Paige is certain that he cannot have been the culprit and is determined to clear his name, even if it does put her in danger herself. A glee club-based cozy mystery is the perfect fit for Charbonneau, an always funny and entertaining author with a background in music and voice coaching. Murder for Choir is definitely a change from her Rebecca Robbins series, adhering closely to the conventions of a cozy mystery, but it also has many of the hallmarks of her Skating books, such as an endearing heroine and the eccentric older relative. 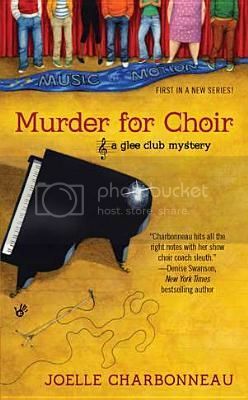 Murder for Choir follows the basic cozy outline without seeming formulaic, and Charbonneau’s humor ensures that it is always a joy to read. Pick it up, then when you thoroughly enjoy it, go back and read the Rebecca Robbins books as well. For more, see my review for SheKnows.com.